Borneo Orangutan Indonesia : How To Get There? 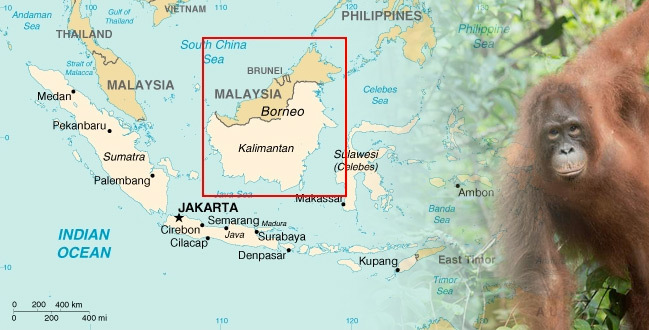 Orangutans in Indonesia are live in Sumatra and Borneo (Kalimantan) island. There are many tour travel agents in Indonesia that will be happy to guide you to visit the Orangutan destination. But first, please consult guidebooks before making your travel arrangements. In this opportunity, the site presents to give you some information about how you can get the Orangutan destination. Mostly, the pictures and information here is about Orangutan tour in Borneo (Kalimantan) island, precisely located in Tanjung Putting National Park In Pangkalan Bun, Central Kalimantan - Indonesia. So, you will get the information about how you can get to Tanjung Putting National Park. To reach Tanjung Putting National Park, you will need to fly to the airport of Pangkalan Bun, Central Kalimantan. From USA/Europe/Australia/Asia/Singapore, the easiest way is you fly to Jakarta. Then from Jakarta direct fly to Pangkalan Bun (Central Kalimantan - Borneo Island). If you start from Bali the easiest way to reach Pangkalan Bun is you need to take early flight from Bali to Jakarta then from Jakarta connect to Pangkalan Bun. Other alternative flight you can fly from Bali to Yogyakarta but need to stay overnight in Yogyakarta or Semarang then drive to Semarang (if you stay overnight in Yogyakarta) to catch your flight to Pangkalan Bun. There are no direct flights from Bali’s Denpasar airport (DPS), but you can also fly to Surabaya (SUB). Pangaklan Bun (PKN) is in Central Kalimantan in Indonesian Borneo and it is the closest airport to Kumai, gateway to Tanjung Puting National Park. Fly from Jakarta to Pontianak (West Kalimantan) and then on to Pangkalan Bun (PKN). These fligts are cheaper but you will have to stay overnight in Pontianak before flying south to Pangkalan Bun, since the small plane to Pangkalan Bun leaves very early in the morning. Fly from Jakarta to Pangkalan Bun via Palangkaraya. You will have to spend a night there before flying into Pangkalan Bun. Flights out of Pangkalan Bun do connect with onward flights to Jakarta. There is also a bus service between Banjarmasin. But please contact an Indonesian travel agent if you are considering this route. Be aware that flights are more likely to be delayed than on time. Flights do get fully booked especially during religious holidays. For your information, Pangkalan Bun is a small town and the flight to go out from this town only ONCE A DAY. So please make sure you allow enough time between flights in Surabaya and Jakarta, as there are sometimes flight delays due to inclement weather. Flights to and from Kalimantan typically leave and arrive on the same day, even if there are weather delays. It is best to arrive the day before the tour, just in case of weather delays. It is not recommend to CONNECT INTERNATIONAL FLIGHT with domestic flight from Pangkalan Bun but at least one day before you should stay at big city with the international airport connection in case some delay or cancel flight from Pangkalan Bun. You then need to make your way to Kumai. It is about 20 minutes taxi ride from Pangkalan Bun. From here you can organize your boat (local people called it as klotok) for about 2 hours journey up the Sekonyer river to the RImba or Eco Lodge, your base whilst exploring the area. It is also possible to sleep and cook meals on the Klotok. In order to travel in and out of the park, it will be necessary to keep the Klotok during your trip. Speedboats can also be hired. The Rimba and the Eco Lodge are about 2 hours from Kumai. Camp Leakey is a further 2 to 2,5 hours up river. Tanjung Putting National Park is the amazing national park in Central Kalimantan. The park is very low and swampy, containing nip a mangrove swamps, tropical peat forest, and tropical heath forest. All of these forest types are found within the study area of Camp Leakey, which lies within the park itself. Enjoy your day here and explore the Orangutan tour.